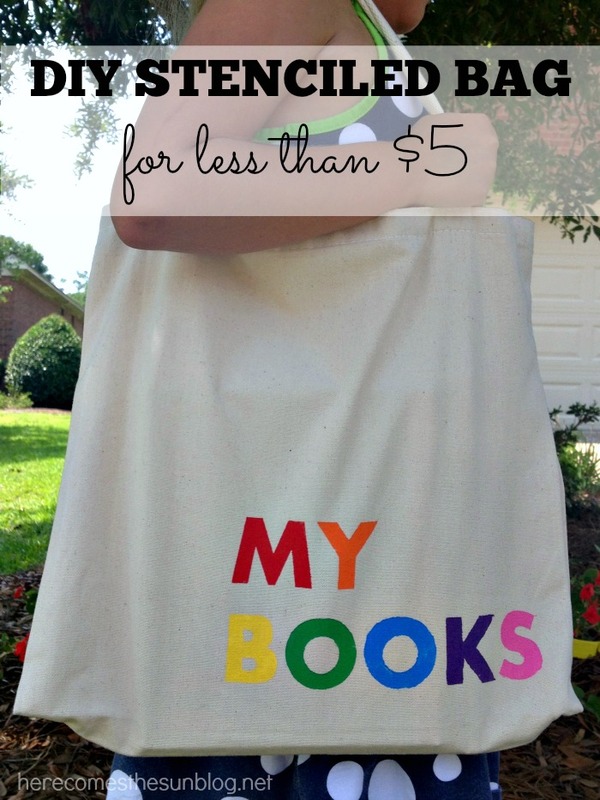 DIY Stenciled Bag for Less than $5! My daughter finished first grade last month and has developed a love of reading. She is doing lots of summer reading (her favorite being The Magic Treehouse series) and looks forward to our trips to the library to pick out new books. Since she comes home with armfuls of books every time, I decided to make her a bag for all of them. 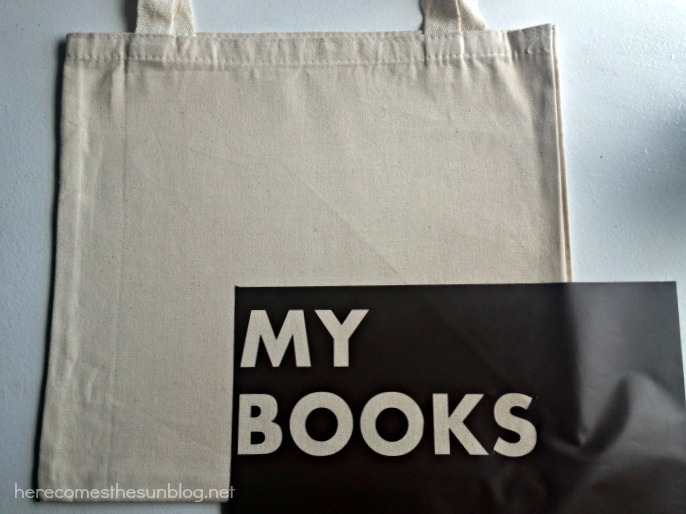 Here is what I came up with… A DIY Stenciled Bag. 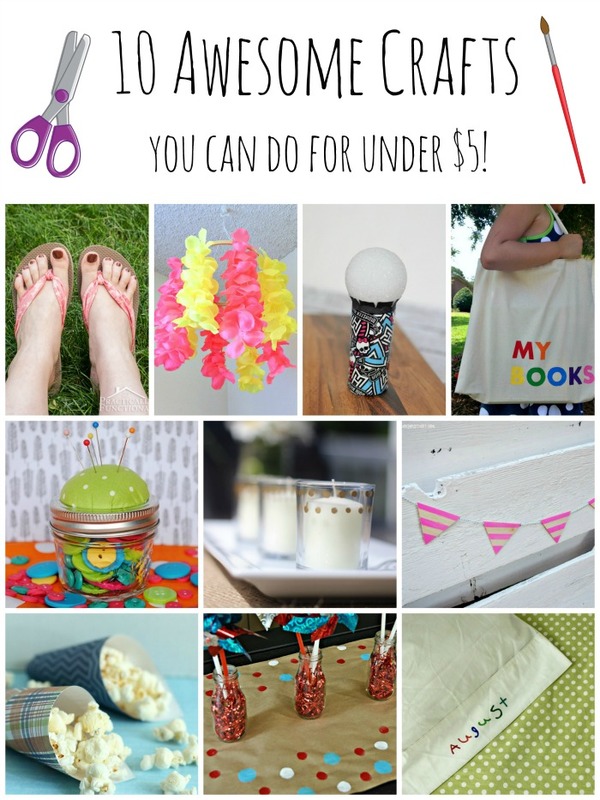 This craft costs less than $5 and takes only 30 minutes to make! I had everything on hand except the canvas bag. It was $1.99 on sale at my local craft store. If you need paint and a brush, you can pick them up for less than $3.00 total. Hand drawn letters (instead of the stencil) work too. Place your canvas bag on a flat surface. Put a piece of cardboard inside so the paint does not seep through to the back. I created my stencil with my Silhouette machine and vinyl but like I said, you can hand draw the letters or create your stencil using freezer paper and an exacto knife. Place the stencil onto your bag, making sure the lettering is straight. If you are hand drawing your letters, use a light pencil. Paint each letter, working from the outside of the letter towards the inside. This reduces the amount of paint that seeps underneath the stencil. If you have hand drawn your letters, just fill them in with the paint. Peel the stencil off while the paint is still slightly wet in order to get nice crisp lines. That’s it! So easy! My daughter loves her new bag and I love that I am no longer the pack mule carrying all the books. I’m going to make one for my son too. I still have a plain bag that we received at SNAP… maybe it’s time to doctor it up a bit? I didn’t realize your daughter and my son were the same age! He just finished first grade as well. Such a great age, huh? I’ll have to find that bag that we got! I can’t believe Madison is starting 2 grade soon. They grow up too fast! That bag is so cute; I love how you personalized it! Pinning! This is so cute. 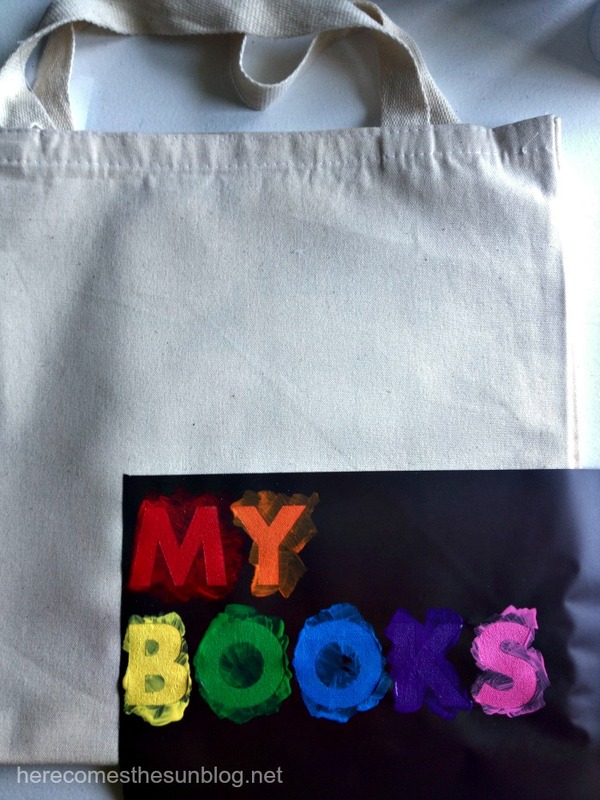 My daughter lost her library bag and this would be a great replacement that she could even help me stencil. It is the perfect project for little ones to help with! 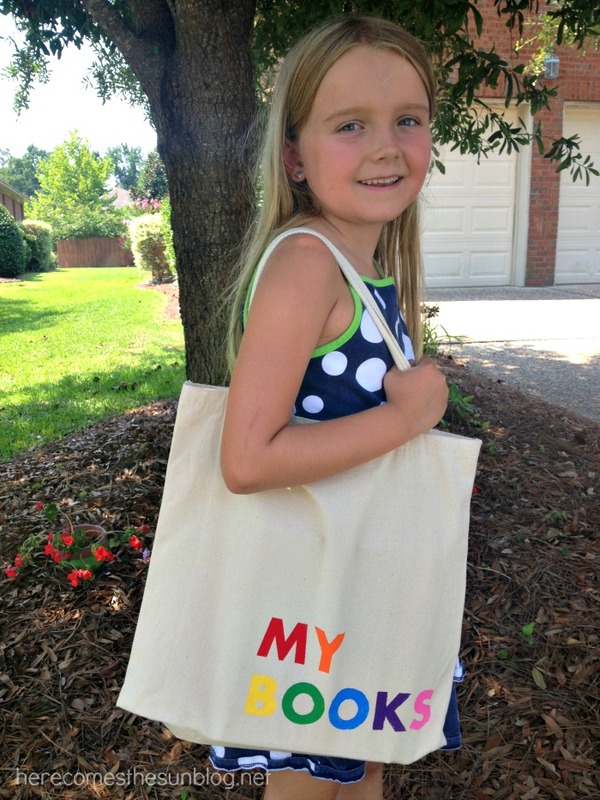 Great bag, and what a cute little reader! 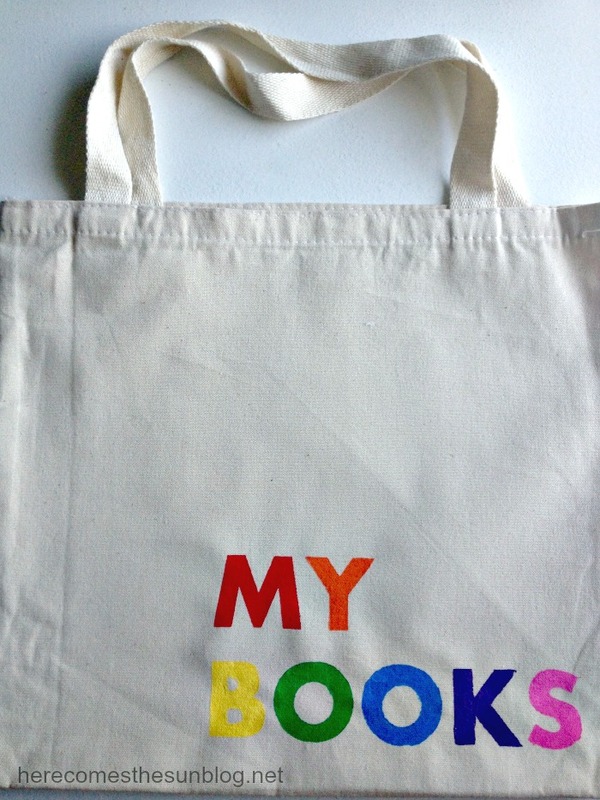 I love the colors on the Tote bag! I’ve always liked a lot of color . I can’t wait to see what you’ll post next!